This Christmas, we are linking up with our charity partner Aware to help shine a light on mental health and wellbeing and to raise money for them with our Christmas themed coffee cups campaign which will run from 1st November until the 31st December 2017. 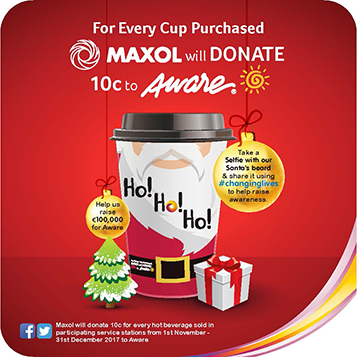 For each cup sold from one of the participating stations in the Republic of Ireland and Northern Ireland we will donate 10c/10p. To find your local participating station, a full list of patricipating stations are listed below.